Three Nobel Prizes have been awarded in medical imaging: for computed tomography (CT), magnetic resonance imaging (MRI), and X-rays. When such awards are made, controversy often follows For the CT scanner, neurologist William Oldendorf believed he should have joined Allan Cormack and Godfrey Hounsfield on the stage in Stockholm in 1979. For MRI, Raymond Damadian was incensed when the award went to Paul Lauterbur and Peter Mansfield in 2003, and placed a full-page advertisement in The New York Times, excoriating the Nobel Committee. In 1901, when Wilhelm Röntgen received his award for the discovery of X-rays, there was another scientist – the Ukrainian Ivan Puluj – whose contributions were ignored. Puluj (seen above right) trained first in theology and then philosophy at the University of Vienna before completing a doctorate in physics on internal friction in gases at the University of Strasbourg in 1876. By 1880 he had developed a special interest in cathode rays and had co-authored a paper in the Annals of Physics with William Crookes, the English inventor of his eponymous tube that produced the rays. Shortly thereafter Puluj developed his own tube, known at the “Puluj Lamp,” which, it subsequently turned out, was capable of generating X-rays (seen below left). Apparently both Puluj and Röntgen worked in the same department under the guidance of August Kundt at Strasbourg, while Röntgen regularly attended lectures given by the Ukrainian. Normally when a scientist fails to receive recognition for his or her contributions, it is because the work has not been properly disseminated. This wasn’t the case with Puluj, however, whose groundbreaking research was published by the Austrian Academy of Sciences between 1880 and 1883. In the 1880s, well before Röntgen’s experiments in Würzburg in November 1895, Puluj reportedly made a photograph of a 13-year-old boy’s broken arm and another of his own daughter’s hand with a metallic pin lying beneath it. In what must be the ultimate irony, Puluj presented one of his lamps to Röntgen. 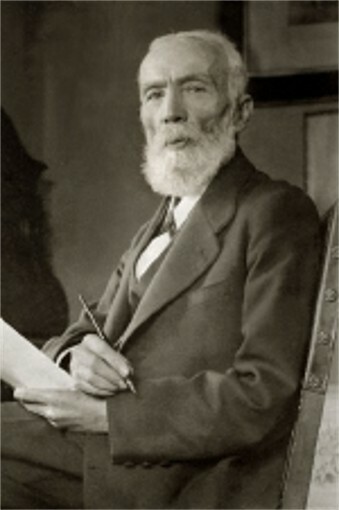 So, why was Röntgen and not Puluj credited as the discoverer of X-rays? Slavko Bokshan, a Serbian scientist who had worked with both men, argued: “World history has never been just to certain individuals or certain nations. Small nations and their achievements are often neglected while the accomplishments of large nations are at times exaggerated.” Puluj was obviously a self-deprecating man who, in 1896, referred to X-rays as the “invisible cathodic beams discovered by Professor Röntgen.” In 2016 we are pleased to recognize the forgotten man of X-rays.